Dia for MAC OS X is an open source, cross-platform application designed for creating and editing diagrams. 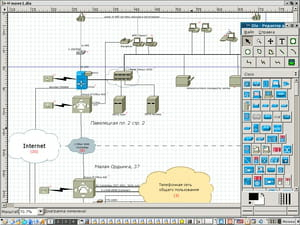 It has a simple interface and is an excellent alternative to Microsoft Visio or FlowChart. Creating charts: this program offers its user the ability to create flow charts of all kinds such as electrical diagrams, entity relationship, UML, mechanical, networking and many more. Indeed, this application already includes all necessary and easy-to-use-tools for performing these actions. Saving: All diagrams created using Dia for MAC OS X can be saved in different formats such as PNG, SVG, EPS, xfig and WMF. The user just defines the output format of his choice as well as the destination folder where to store them. Sharing: Dia allows sharing creations with other persons regardless to the kind of computer they use or the fact they have not the source application installed. That is possible thanks to the fact that charts formats are common ones as seen above. The download and the use of Dia for MAC OS X are entirely free of charge. As it is an open source, the user is free to customize the application's interface to fit his preferences. Latest update on April 20, 2015 at 04:50 AM.